FIFA 19 Ultimate Scream is here, offering a special, limited-time boosted set of player cards. They feature an awesome spooky design, and two stats boosted up to 90, making them hugely valuable. Read on for all the info you need, including which players are included in FIFA 19 Ultimate Scream and how to get hold of Ultimate Scream cards in FIFA 19. In this FIFA 19 Ultimate Scream guide we’ll detail what the special Halloween promotion is, how to get the Ultimate Scream cards, what bonuses the Ultimate Scream cards have, and when Ultimate Scream starts. FIFA 19 Ultimate Scream is a special Halloween themed event for FIFA 19 Ultimate Team. Over the Halloween period a special squad of new player cards will be released, each having an in-form boost over the original cards. What’s more, the cards will increase their stats significantly for three or four days near Halloween. These boosts can be as much as 10 points, making for hugely impressive players. There's also a brand new shapeshifting system this year, just to spice things up a little. 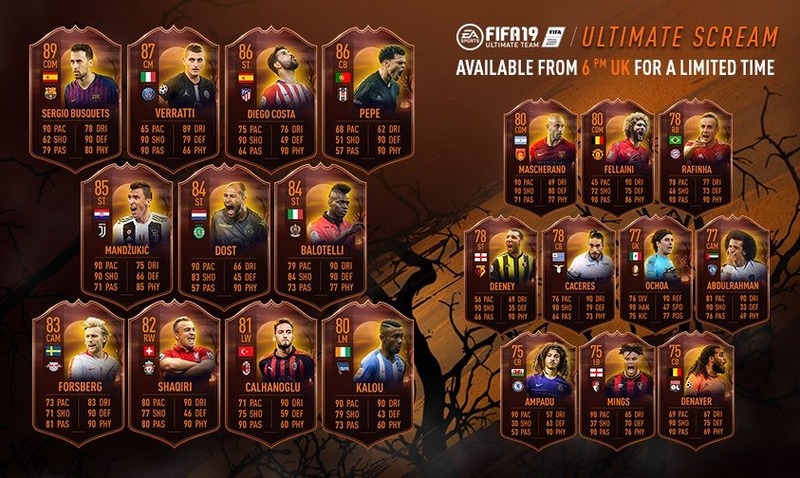 As a standard, the FIFA 19 Halloween Cards get a +1 to their overall rating, as well as a boost to two of their stats to 90. The players who are chosen to be part of the FIFA 19 Ultimate Scream squad generally come from those who have put in brilliant performances in the real world of football or have suitable stats. FIFA 19 Ultimate Scream starts on Friday, October 19 at 10am PDT/ 6PM BST. The event is set to end after Halloween. FIFA 19 Ultimate Scream cards are released like any set of promotional cards. For the period they are available they replace the original cards in card packs. This means that if you you have the same chance of finding an Ultimate Scream card as you would any high quality player. Buy card packs and hope you’re lucky or head to the marketplace. These are the players included in FIFA 19 Ultimate Scream. We'll be updating this page with a rundown of the best cards to get your hands on as as soon as we've had time to consider the line-up. Should You Invest in FIFA 19 Ultimate Scream? Once the FIFA 19 Ultimate Scream event finishes, usually after Halloween (so the start of November), the special Ultimate Scream promotional cards will be removed from card packs, meaning you’ll only be able to buy them from sellers on the marketplace. Although the player stats won’t be as amazing as they were over Halloween, these cards will still fetch a lot due to collectible value. One of ways that you can earn the Scream Team Players is via SBCs. A few FIFA 19 Halloween SBCs have been added, requiring you to build specific decks of players. You'll get rewards for completing each one, so they're definitely worth looking into. If you choose to do so, immediately sell Scream Team cards as you get them as they likely won't go up in value after the event is over. Keep in mind that EA says the Scream boosted stats will reappear during "scary times", though it's unclear exactly what that means.